Last time, I shared strategies on how to minimize rental vacancy before you close on your new property purchase. To minimize rental vacancy, it’s critical to find and vet your remodeling contractors early. But how do you do that exactly? That’s what this post is about. How do you find good contractors? And how do you vet them? Find out. The challenge is finding a contractor who has as many of these qualities as possible within your budget constraints. 1. Rank the qualities above in the order most important to you. This helps you clarify what you value most. You have to understand that to have the best shot getting the most value from your contractors. If price and quality are must haves, it’s important to be aware of that, because you may have to give up other things like cleanliness, punctuality, or good communication. By contrast, if Nordstrom-level customer service is most important, then you may need to prepare to pay a premium for it. Remember, contractors are tradespeople. They work with their hands. They’re often bad at customer service. Sometimes they can be downright unprofessional. To provide good customer service, the contractor may need to hire a project manager or client service person. Which means they have to be able to afford their salary and benefits, even while that person doesn’t directly earn revenue for the contractor. Well guess what? That person’s salary is ultimately paid by you. You get charged higher prices for your job. If the contractor has a good reputation, the premium will be even higher. Example: when I was gathering price quotes for a kitchen remodel, quotes ranged from $10k-$70k. Sure, things like cabinet quality and finishes influenced the price differences, but the bulk of cost is always labor, and in my case the expensive quotes were all from large shops with heavy management and staff overhead. Lower cost guys are usually 1-2 man shops. But don’t expect them to have good customer service. 2. It’s a numbers game, so fill up your funnel. The key to finding good contractors is to have a lot of leads at the top of your “funnel.” Filter them using the criteria/qualities most important to you (see above), then make sure they’re actually available to do the job, and hopefully you’ll end up with a handful of good ones at the bottom of your funnel. The key to finding good contractors is to have a lot of leads at the top of your funnel. Separately, I also suggest creating a list just for “handyman,” since a handyman can do a lot of small tasks cheaper than a licensed contractor – and you’ll probably have a lot of small tasks to do right after you purchase the property, plus ongoing while you operate it. To find contractors for your lists, don’t be shy about asking for recommendations from friends / Facebook and browsing tons of profiles on sites like Yelp, Thumbtack, Home Advisor, Porch, even Craigslist. When I created my lists, I had 15-50 contractors for each remodeling item. In deciding whether to add a contractor, I looked at their star ratings online, written reviews, photos of past remodeling jobs, and service areas covered. 3. Create email / text message templates. Draft message templates in a Google doc describing your scope of work. You’ll use this to email contractors later. Example: for a kitchen remodel, describe how you want to demo old cabinets and countertops, remove a non-load bearing wall, and expand the layout for a more open feel. If upgrading a bathroom, describe the look and feel for the shower and floor surfaces, maybe even materials you’d like to use. If replacing carpet, describe the color you want and how many rooms / how much square footage there is, whether there are stairs in the house, etc. Now, customize your inquiry template(s) for each contractor. Copy-paste it into Gmail and wordsmith as needed before sending (e.g., you can customize intro to describe how you found them – Yelp, friend recommendation, etc). Spend the time to personalize each message, at least a little bit, because it will increase your response rate. 4. Include lots of photos and video. You took lots of photos and videos during your property visits, right? These are crucial to giving contractors a meaningful idea of your scope of work…and setting the right expectations. Upload your videos to YouTube and send the YouTube link. In your videos, it’s super helpful to personally narrate a voiceover while recording to orient the viewer on what they’re seeing. Describe everything the camera is recording as if you were doing it for a blind person. A good contractor can get a LOT of context from a well-narrated video and clear annotated photos. With these, they should be able to provide, if not actual price quotes, then at least ballpark ranges. A good contractor can tell you a lot from well-narrated video + clear photos. This saves time because it cuts down on the number of visits, delays, and idle waiting (“my next available slot is two Mondays from now”). 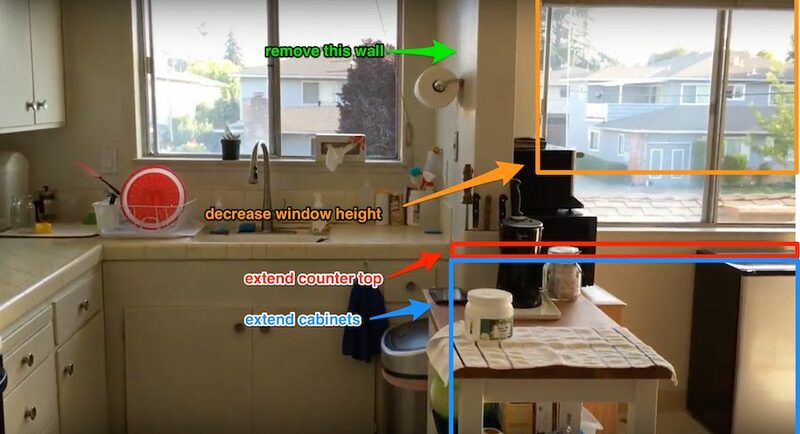 Good videos and photos, moreover, drastically cut down on the back and forth communication needed to describe the property condition and get on the same page. The contractor can quickly “T-shirt” size the problem: small, medium, or large. 5. Send out your emails / texts. Now it’s time to actually send out customized emails / texts and get responses. I usually send them in waves. Reason: it takes time to create lists of contractors for each task; I don’t want to wait until I’m done creating all these lists before sending out the first emails. I want to get feedback from contractors ASAP, which is why I strongly recommend sending your first inquiries as soon as you can. Finish a list, then email them. Then start your next list. You can usually find a contractor’s email on their website or online profile. If you can’t find it, text them your email template instead; you can almost always find their phone number on Yelp or by Googling around. 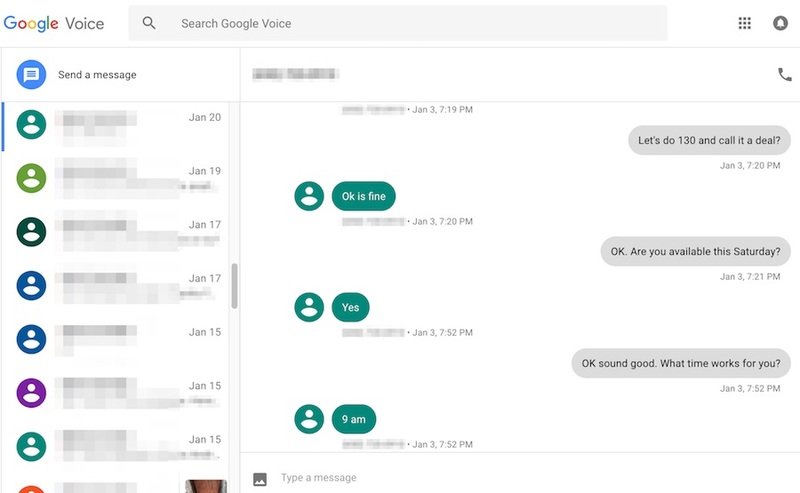 If you text them, use the Google Voice website to do it: it’s MUCH easier to type fast (and copy-paste) using your keyboard vs. phone. I even suggest prioritizing text messages over emails. Most contractors respond faster to text (since they may only check email at night after they get home). Most contractors respond faster to text: use that to your advantage. Now, if those early contractor responses repeatedly ask the same questions / clarifications, that’s a nudge for me to go back and edit my template to proactively answer those questions. I’ll then update subsequent emails. This is another benefit of getting contractor feedback early: it helps you improve communication with later contractors. Another benefit of early contractor feedback: improves comms w/ later contractors. I should also say, since many contractors are really bad at staying on top of their email/messages, I use a spreadsheet to track whom I’ve contacted, when, and whether they responded. If a contractor does not respond but has good reviews online, I will usually follow up 1-2 times before moving on (a quick nudge is enough: “Hey Bob, just following up on this.”). 6. Bucket the responses and score them. After you send your emails / texts, you’ll generally get responses falling into one of three categories. Price increases happen when the contractor discovers new conditions after opening up things like walls and floors. This is legitimate. They may have been burned before, so they’d rather be conservative and refrain from quoting prices until they see it in person, even if it means losing the job. Price increases happen when contractor discovers new conditions after opening up walls/floors. Other contractors may refuse to give you a rough ballpark range because they want to sell you in person. It’s easy to delete or say no to an email or text. Much harder to do it in person. The contractor may want to show you in person how knowledgeable they are. Or use scare tactics to make you think the property condition is worse than it really is (often by telling you a previous contractor or builder did something wrong, which will get worse unless the new contractor fixes it). My suggestion: if you make crystal clear upfront that you are ONLY looking for a rough estimate range for now, and you promise NOT to get upset if they legitimately find new conditions requiring a price increase, then the contractor really has no good reason to deny giving you a ballpark price range by email / text. If the contractor still balks, even after assuring them I understand a site visit will be required to finalize a price quote, and even if I promise not to get mad if their initial ballpark price increases upon closer inspection, I just skip them and move on. Yes, I get that there is a lot of “price discovery” that happens when the contractor is physically inspecting the place. But if they are unable or unwilling to throw out even a very rough non-binding range when I’ve supplied them with a thorough and thoughtful description of the scope of work, plus multiple (annotated) photos and videos, then I think it’s fair to infer they’re just being difficult. Think of it this way: even if they come inspect the property, it’s not like they can tear open the walls and floors anyway. They’re not going to see anything different than your video shows; at most they’ll be able to look more closely and touch visible surfaces…but that shouldn’t prevent them from simply telling you a very rough ballpark range, right? My view is, any contractor worth his weight should be able to at least give you a rough non-binding estimate based on a thoughtful email and photos/videos. The only exception where I might still invite the contractor for a site visit is if he was sensationally recommended by a trusted friend or colleague. Otherwise, I don’t need that kind of difficulty when I’m only asking for a rough idea of pricing and have promised not to hold it against them if they need to revise later. The third bucket of responses you’ll generally get is where the contractor goes ahead and gives you a ballpark price but caveats that he must see the property in person to finalize it. Depending on the quality of their responses and follow-ups, I’ll invite “finalists” from the second and third buckets for a site visit to give formal bids. I do this by scoring each contractor based on the criteria I prioritized (shared earlier in this post). You can list each contractor on a spreadsheet row and each of your criteria as a separate column. Then you can score each contractor row against each column. Sure, you may not have enough info yet to score things like “shows up on time every day,” but that’s OK. You’re only trying to get a directional sense here and it’s fine to use partial info. The exact scoring rubric doesn’t matter. What matters is that you have a way to analyze which contractors are good vs. not in terms of your criteria. Contractors who score highly are generally worth inviting back for formal bids. 7. Invite finalists to give formal bids. Usually, I invite no more than 3 finalists (per remodeling task) to give formal bids. Three bids is sufficient to sanity check your scope of work, uncover any surprises, “pressure test” each contractor, and know what a fair price is. Since I tend to invite no more than 3 finalists onsite, it means there’s a good chance a contractor who comes onsite for a formal bid will actually get the job. 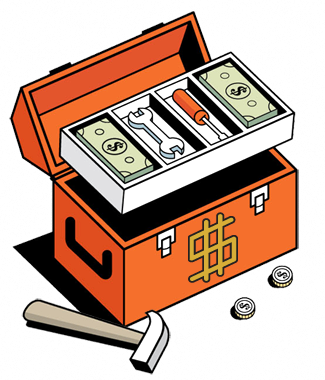 3 bids = sufficient to sanity check contractors, uncover surprises, and know fair price. 8. Clarify bids, then prioritize. After contractors do their inspections, they will usually send you formal bids within a few days (follow up if they forget: you went through the hassle to get them there, you should at least get their formal bid). Make sure the bid you receive isn’t just a price but has in detailed writing exactly what’s included in the scope of work. Headache saver: Make sure remodel bid specifies in writing exactly what’s included. Does it include demo? Debris removal? Materials and labor together, or just labor? Partial materials – how much, which items? Does it include permits? How long are they estimating to finish the job? When can they commit to start? Make sure to get every work item in writing, including itemized prices, and bullet point lists like a madman to make sure nothing falls through the cracks. Point is to make sure everything you agree to is documented. Leave a huge paper trail. Goes without saying, but it’s always easier to point to written documents vs. argue from memory. With formal bids, you can now easily [return to your spreadsheet] and fill in actual dollar amounts vs. just “T-shirt size” estimates. With exact costs filled in, you can now sort more accurately by bang for buck. And that’s what ultimately matters. By gathering as much data as possible in advance using the process explained in this post, before you start scheduling, you’ll save lots of time and hassle when it comes to booking appointments. That’s because many contractors (especially good ones) are hard to schedule. They’re regularly booked. Some contractors are also VERY unreliable showing up on time. They might arrive an hour late. Or an hour early. They thought the appointment was Friday when it was actually Saturday. Or they just forgot it entirely. Again, they’re tradespeople. Not customer service professionals. Many don’t care for customer service much at all. This can be especially true for small 1-2 man shops. Only larger contracting companies can even afford to hire project management, secretarial, or customer service staff to handle communications. By doing the work upfront to vet folks before you schedule them, you’re saving yourself a lot of headaches and disappointment. Plus, you’re also educating yourself to ask good questions, and that’s going to help you create more insightful discussions when the contractors actually do show up. 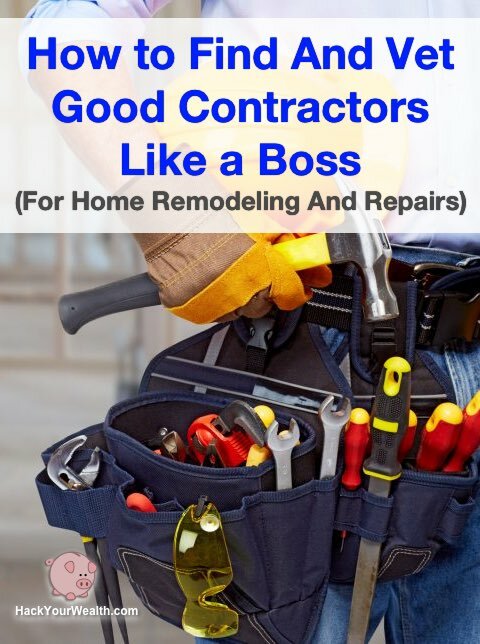 But unless you plan to pay a pretty penny for a general contractor (who, I’ll add, won’t manage your project as efficiently or cost-effectively as you will), you’ll need to do this legwork to find good, affordable contractors. On the bright side, if you get good at this process, you’ll be finding good contractors like a boss in no time!